shows like a model home! this beautiful 3 bdrm, 4 bath, less than 1 yr old, energy star qualified home is certain to impress and offers numerous upgrades and neutral dcor throughout. main level is complimented by over sized ceramic and rich, dark hardwood flooring along with convenient laundry access off the garage entry, separate office space and open concept kitchen/living/dining with 9 ft vaulted ceilings, centre island for the hub of entertaining and stunning backs plash. 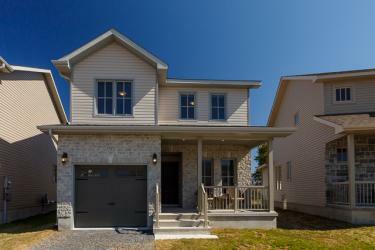 upstairs 3 generously sized bdrms, full main bath, master with walk-in closet and ensuite. downstairs professionally finished media room, 2 pc bath, and additional storage area all for your enjoyment.